Until this past weekend at the Tamarack Northwest Mountain Challenge, the title of this post was a reaction I often received after explaining that we are starting a backcountry foods company for the committed outdoorsmen. So thank you to everyone who came by our booth at the Tamarack shoot and provided us a refreshing new reaction along the lines of “it’s about time”. We appreciated your kinds words and excitement, and while our rush to get licensed and labels printed prevented us from having product ready for the masses, we are now taking orders on our entire first line of products and will be shipping our first orders next week! So now that our website is active (not perfect, but active), and we have officially made our first web sale, glad to say WE HAVE started a backcountry foods company with an obvious emphasis on what we love. So we’re here. Who are we? What are we about? What are our plans? We started Off Grid Food Company for a multitude of reasons. It’s no secret there is a lack of diversity among backpack friendly food options, and it is easily noticed that of the options available, few cater to, or even support the hunting community, and directly give back to conservation. We also feel that among these readily available backcountry offerings, few, if any, are sourced, crafted, and produced with the quality and care that a hunter certainly understands. My name is Spencer Trippe, I live at the foothills of the Washington Cascades, just south of the Canadian border, with my wife, two boys, and our huskies. I grew up hunting upland birds and fishing the lakes and rivers of northern Michigan, where like most, my father instilled in me a deep connection to the outdoors. Fortunate to frequent the west as a kid, I knew where I was going when I graduated High School. 11 years ago, one of my best friends and I drove to Bellingham WA, and after a 7 year, multi-state Van Wilder type battle with higher education, I graduated with a business degree from Western State College of Colorado in Gunnison, Colorado, and a deeper love and desire for the outdoors. Over the last 11 years I’ve lived in Washington, Colorado, Oklahoma, Florida, Texas, back to Colorado, and then back to Washington with a summer in Alaska in between. I’ve worked as a oil and gas contracts agent and as a big game guide, with various roles in between. Hunting has changed my life for the better both physically and mentally over the last number of years, and I guess, over that period of time, has in many ways, led me to my current location, typing this entry as I get ready to fill our very first order, and combining my love for hunting and love for food to fill the needs of the wonderful people that make this community so special and unique. That’s our drive, and providing a unique and specific approach to how you eat in the backcountry is what we’re here to do. Why food? I don’t know, I’ve always loved it, it was always a focal point of connection for our family. My aunt is a long time professional chef, and everyone in my family cooks phenomenal food. My appreciation for food and cooking has changed over the years to not just loving the flavor and complexity of a dish and how it was prepared, but more towards how it was grown, sourced, and the work involved in getting it to our plates. I remember as a kid I would sit up in my room well past midnight watching the food network and the outdoor channels like a fiend, back and forth. My first kitchen job was at 15, and I have worked my share of restaurants as well as in many private and catered settings from executive dinners to a summer as Chef on a commercial fishing boat in Alaska. As a hunter, I butcher and prepare our own game from burgers and unique primal cuts to cured sausages, and believe that simple real ingredients cooked to perfection can never be outdone. I enjoy gardening, and preserving our own vegetables, and I really like elk, bears, and waterfowl. As you have hopefully already noticed, the products for our first line of offerings is limited to our non-meat products. Sure we could contract someone out to do our full line of freeze dried meals for us immediately, like all of the other companies out there, but I don’t take my elk to a butcher for the same reasons I won’t outsource CERTAIN aspects of this business, EVER. We desire to be the first hand-crafted, self-produced line of quality freeze dried meals for the committed backcountry sportsman. We currently work out of a very high end commercial catering kitchen. Unfortunately, We do not have a designated room that would separate our “meat” from our “non-meat” operations. So, we have to build a room specific to our products containing meat that gains USDA approval. While it would be legal for us to sell meat in a direct to consumer setting like a restaurant, we cannot package, and sell across state lines without the USDA stamp you see on all (well, most) packaged products that contain meat. So for now, we will offer a full line of jacked up oatmeals (just read the ingredients), a grain free instant cold cereal (my favorite), trail mix (varieties coming soon), 3 flavors of our coconut and almond fuel bars, and 3 flavors of our MCT oil almond butters in both 16oz jars or a 10-pack of our 1.5oz “SoloPaks”. We are also working to partner with a wonderful family run company who will produce our jerky in small batches for us as a side product as early as August, 2017. All grass fed, gluten and soy free. We are continuously planning and testing our full menu of meals, utilizing the highest quality grass fed meats and ingredients from sources that meet our strict standards. We hope to have them ready well before the 2018 hunting season. Keep your eyes peeled for new products, special offerings, testing opportunities, as well as full meal pre-orders and special campaigns to help us reach our goals and get that USDA stamp of approval. 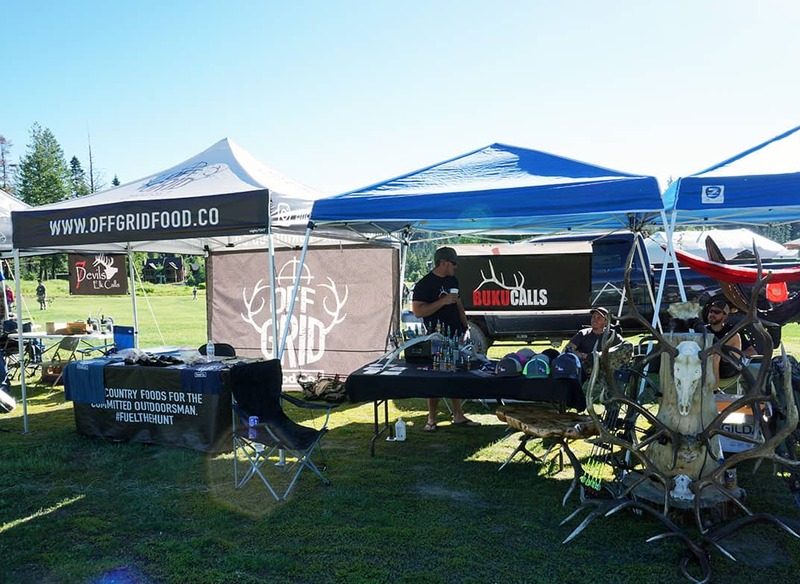 We appreciate the support, and hope that you choose Off Grid Food Company to fuel your hunts. Feel free to call or email anytime. I love to BS about hunting and food. This entry was posted in Off Grid News and tagged Backcountry foods, Hunting, OffGridNews. Awesome story and love your vision. As a Bellingham resident myself, it’s great to see a local company making fantastic meals for hunters. I’m looking forward to trying your food on some hunts this fall. Nice to see you Spencer at the Bonefish and Tarpon Trust Symposium in Florida. The trail mix sample you gave us was delicious. Good luck with Off Grid Food Co.